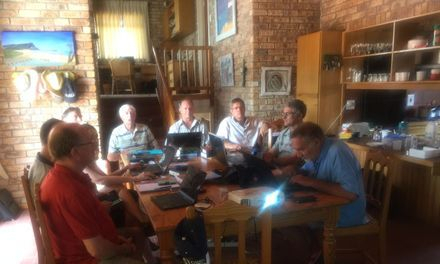 Participants: Frans Hancke, TC du Toit, Ensie Enslin, Hendrik Saayman, Johann Du Plessis, Kobus Kellerman, Werner and Tania Schultz (Kid’s Xpress). 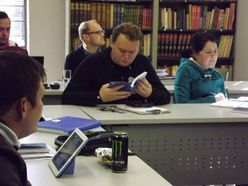 Geo de Kock acted as co-ordinator. One of the outcomes of our deliberations is that we have discovered that all our R&D’s actually must be structured and conducted with a focus on the reason why it is called together. The specific task is determining the structure of the meeting: the location, the number and identity of participants (according to personal skills and concern in connection with the task), the outcome needed, time available, costs, etc. During this R&D we had to seriously re-visit the different tools we are currently using in our work-shops (missioristics, building blocks and questions). We realised that the full scope of work necessitated a meeting with a core group of participants. And it worked very well! Frans is also working on a list of the different tasks or functions with which members can be busy with, so that we can make sure we are all active in a working group in line with the calling and aim of thePLAN. All this we can discuss again at a following Encounter/R&D. The co-workers of ThePLAN had a Research and Development Workshop on 22nd to 26th of July in Pretoria. These workshops are held as regular as possible to enhance the quality of the material of ThePLAN and keep it up to date with the most recent research. This time around the theological building blocks of ThePLAN were revised and reformulated, where thought necessary. Attention was also given to the MissioMatrix Questionnaire. It is a tool to measure to what extent a congregation is understanding God's plan and fulfilling their roll in it. 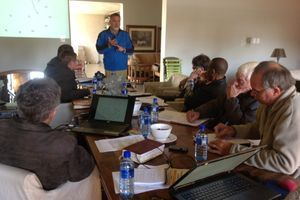 Co-workers of ThePLAN at work during their latest Research and Development Workshop in Pretoria. The leadership of the DRC of Langen-hovenpark had a weekend camp at Menuha Retreate Centre under leadership of Dr. Frans Hancke during the weekend of August 16-18, 2013. This congregation is exposed to the material of ThePLAN for about two years and in the process of implementing it in the congregation. During the weekend camp they were strategizing on helping the congregation to understand and live God's plan for them by using the MissioMatrix Questionnaire as tool. 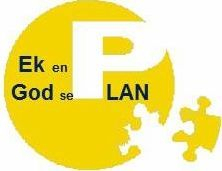 The brand new workshop developed by Dr. Hancke, God's plan and I, was introduced at DRC Nahoon in East London (South Africa) at the beginning of June 2012. Since then Dr. Hancke presented this workshop at several venues, some being Tsabong and Bokspits in Botswana at the fall of July 2012. The workshop was accepted with acclamation and there were several testomonies of life changing experiences. We believe that this new addition to the material of thePLAN is a powerful instrument in the hand of God, awakening His children and helping them to obey His call to make a personal and intentional difference in their communities. Dr. Hancke's short article Factors influencing extensive personal witnessing and increasing the missionary commitment of the church is giving some theological background about this workshop. 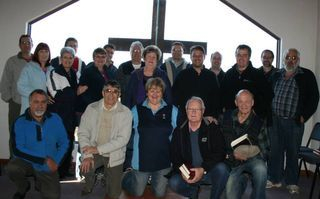 Dr. Frans Hancke's book, We are the Plan, forms part of the curriculum for the students in their final year of studies at the Theological Seminary at the University of the Free State. Recently he had the opportunity to meet these students for lecturing and discussions on the book. It always is a very blessed experience to see how the student's perspectives on the church are influenced by the contents of the book. It really is our prayer that this pastors-to-be will carry these insights with them into the congregations which they will be serving!